Ask South Indians the comfort and complete feel of relishing a meal when spoons are avoided and hands are used. Eating through hands is always a satisfying feel. Can we ignore the joy we had when we ate from the hands of our mother? But sadly not many have this privilege of eating through their own hands. Some of the differently abled people need assistance from someone to eat and when their dear ones are not near, they need to wait. 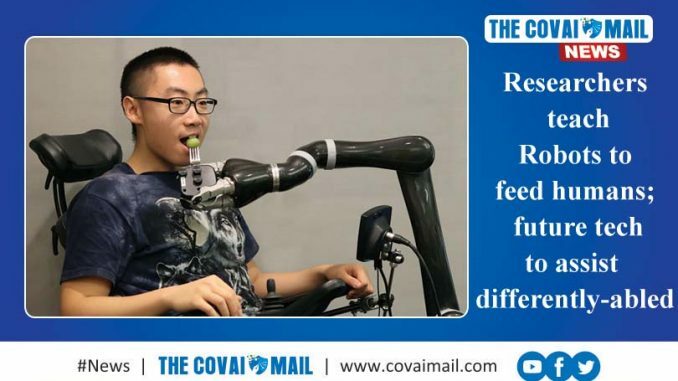 In order to give a solution to those who need external assistance, the brighter minds at University of Washington are working on a project to teach a robotic arm that could learn to differentiate different fruits and other veggies. Using Artificial Intelligence, Machine Learning and a camera mounted on top of it, the robot learns everything. One of the researchers and brains behind the project, Siddhartha Srinivasa, Professor, Computer Science and Engineering at University of Washington has said that the project is in its nascent stage and will take a decade to feed perfectly. The team has tweaked the Amazon Alexa and through it when a researcher tells “Alexa, pick up a strawberry, it responds and replies”. In America alone, approximately 11 million+ people need the help of someone to assist with their daily routines besides eating like bathing and dressing. Hope this technology gets perfected soon.